Brad graduated with a Bachelor of Arts in Legal Studies from the University of Ontario Institute of Technology (UOIT) in 2013. While at UOIT, Brad was one of the first members of the Student Law Association. 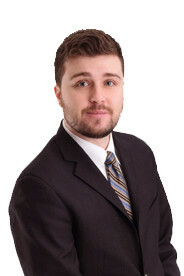 In 2014, Brad graduated with honors from his Paralegal program at Durham College and became licensed to provide legal services with the Law Society of Upper Canada later that year. Prior to practicing as a Paralegal at Mason Caplan Dizgun LLP, Brad worked for a small boutique firm specializing in Small Claims, Landlord and Tenant and Administrative Tribunals. Brad has been working in the legal profession since 2004 and has had several years of claims handling experience. As a Paralegal, Brad has carriage of Small Claims Court actions exclusively in civil litigation with an emphasis on subrogation. His main areas of focus include property damage, product liability, water damage and fire claims. Additionally, Brad assists senior lawyers with the preparation of Affidavits, Pleadings and Motions.